The question of knowing for sure. This is one which every leader will face from visitors as well as church members. The surety of salvation is a question which haunts this generation as they are forced to wade through a plethora of voices. Many times these voices are vying for a persons attendance by offering them an easy and unbiblical explanation of salvation. Many times it will go like the following. If you have prayed the sinner’s prayer, and mean it from your heart, you do not have to feel anything because salvation is by faith. Therefore, based upon the Scriptures, if you believe, regardless how you feel, you are saved. Stop questioning your salvation and just begin to thank the Lord that His Word is true. Welcome to the family of God. This is typical of many presentations and explanations in modern evangelicalism. However, the minister who offers the above answer to a searching soul has done a grave disservice to their inquiry. The Scriptures are very clear in presenting several statements which offers the inquiring soul a path of discovering the certainty of his salvation. To leave the issue as just a declaration of unverifiable belief or mental assent, is equivalent to offering salvation to the demons, as they believe and even tremble (James 2:19), but are obviously not regenerated. Many church participants are sitting in regular church attendance and are void of genuine salvation. They know something critical is missing, but they’ve prayed the prayer and been declared saved by a pastor who is driven by the image of numbers attendance statistics. The Apostle Paul taught the opposite. He instructed professing believers to examine their standing with God. In one of his epistles to the Corinthians, he instructed them, because of their behavior, to examine and find out if they are “in the faith.” (II Cor. 13:5) He did not ask them if they prayed the prayer, or if they claimed to have believed. No! He instructed them to look at their lives and examine it. As we will see below, Paul, in his doctrinal treatise of Christianity (Romans), taught that if a person does not have the Holy Spirit they do not belong to Christ. (Rom.8:9) Do we tell people this? If so, how do we answer the question about how they can know they have the Holy Spirt? We’ll see this below. Witness of the Holy Spirit – When a person is born again, the Holy Spirit takes up residence in their life. This is not just a theological truth. It is a conscious reality. Genuine believers have a personal knowing within their heart. (Rom. 8:16; I Jn. 3:24; 4:13; 5:10) A person can simply pray and ask the Lord to reveal to their heart if they are His child. 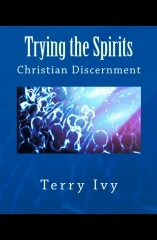 If they are, there will be a conscious knowing and witness of the Holy Spirit to their spirit. But, some will object, the person could get a false impression from their own mind or a demon. True, and this is why there are other questions which will demonstrate if their ‘witness’ is from the Holy Spirit or not. Spiritual fruit – There will be evidence of Spiritual fruit. (Gal. 5:22-23) Jesus said a man is known by his fruit. No fruit, no life! (Matt. 7:16) This fruit, according to the Apostle Paul will be ‘fruit unto holiness.’ (Rom. 6:22) Obviously, this doesn’t mean a believer cannot struggle with sin, but they will have a desire to walk in biblical holiness (heart purity) before the Lord. Hatred for sin – The person genuinely saved will not continue to habitually practice sin. (I Jn. 3:6-10) Again, to get to the bottom of this, we evaluate a person’s desire. The flippant attitude many so-called believers have reveal their lack of the new birth in Christ. Sin is not a laughing issue to those born of the Spirit. It destroys men’s lives and sends multitudes to hell. A person regenerated by the grace of God will have the same attitude the Lord has toward sin. And because of this attitude for sin, a genuine believer will have a desire to repent of any known sin. Genuine believers see repentance as a privilege, not an obligation. These are just a few simple areas which we can ask ourselves about or have our Pastor ask us if we are struggling to know for sure whether or not we are saved. The Scriptures make it clear and simple. There is a certainty that believers can have concerning their salvation in Christ. I’ve seen many struggling saints come to a rest of assurance by looking at these issues and settling the concern of salvation once for all. A precious sight indeed! Likewise, I’ve seen many who thought or were told they were saved, come to realize they have not been born of the Spirit. This allowed them to move out of the darkness and deception of a mental profession into the new life in Christ. The Pastor who makes the question about the assurance of salvation only an issue of ‘have you prayed the prayer and do you believe it,’ will be guilty of neglecting the biblical instructions for the knowledge of salvation. Many men who are members in good standing with a local church will go to hell because they have ‘said the prayer,’ but have never surrendered their life to Jesus as their Lord. They have no living evidence of the new birth in their life. Salvation is more than a mental assent that certain facts are true, it is a personal encounter with the Risen Lamb through faith. And as we have seen, the Scriptures teach us that we can know we are saved for sure!